The IoT Edge module that you create in this tutorial filters the temperature data generated by your device. It only sends messages upstream if the temperature is above a specified threshold. This type of analysis at the edge is useful for reducing the amount of data communicated to and stored in the cloud. You can use your development machine or a virtual machine as an Edge device by following the steps in the quickstart for Linux. Node.js modules for IoT Edge do not support Windows containers. If you're developing on a Windows device, make sure Docker is configured to use Linux containers. Node.js and npm. The npm package is distributed with Node.js, which means that when you download Node.js, you automatically get npm installed on your computer. 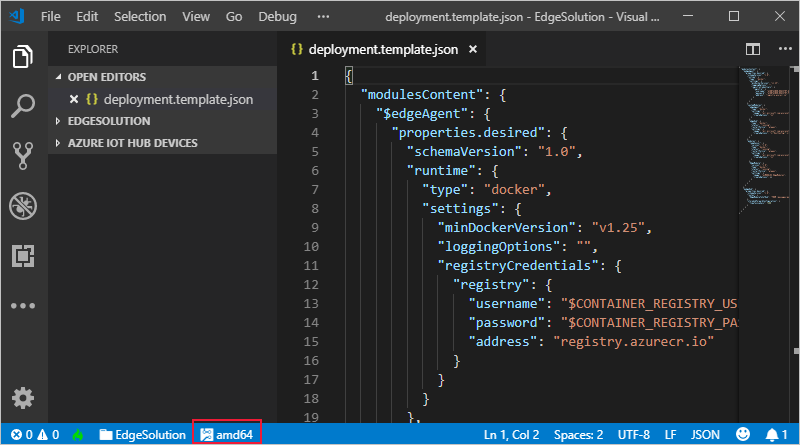 The following steps show you how to create an IoT Edge Node.js module using Visual Studio Code and the Azure IoT Tools. Use npm to create a Node.js solution template that you can build on top of. In the command palette, type and run the command Azure: Sign in and follow the instructions to sign in your Azure account. If you've already signed in, you can skip this step. In the command palette, type and run the command Azure IoT Edge: New IoT Edge solution. Follow the prompts in the command palette to create your solution. Provide a solution name Enter a descriptive name for your solution or accept the default EdgeSolution. Select module template Choose Node.js Module. Provide a module name Name your module NodeModule. Provide Docker image repository for the module An image repository includes the name of your container registry and the name of your container image. Your container image is prepopulated from the name you provided in the last step. Replace localhost:5000 with the login server value from your Azure container registry. You can retrieve the login server from the Overview page of your container registry in the Azure portal. The final image repository looks like <registry name>.azurecr.io/nodemodule. The VS Code window loads your IoT Edge solution workspace. The solution workspace contains five top-level components. The modules folder contains the Node.js code for your module as well as Dockerfiles for building your module as a container image. The .env file stores your container registry credentials. The deployment.template.json file contains the information that the IoT Edge runtime uses to deploy modules on a device and deployment.debug.template.json file contains the debug version of modules. You won't edit the .vscode folder or .gitignore file in this tutorial. If you didn't specify a container registry when creating your solution, but accepted the default localhost:5000 value, you won't have a .env file. The environment file stores the credentials for your container repository and shares those with the IoT Edge runtime. The runtime needs these credentials to pull your private images onto the IoT Edge device. Each template comes with sample code included, which takes simulated sensor data from the tempSensor module and routes it to IoT Hub. In this section, add code to have NodeModule analyze the messages before sending them. In the VS Code explorer, open modules > NodeModule > app.js. Add a temperature threshold variable below required node modules. The temperature threshold sets the value that the measured temperature must exceed in order for the data to be sent to IoT Hub. Replace the entire PipeMessage function with the FilterMessage function. // This function filters out messages that report temperatures below the temperature threshold. // It also adds the MessageType property to the message with the value set to Alert. Replace the function name pipeMessage with filterMessage in client.on() function. Copy the following code snippet into the client.open() function callback, after client.on() inside the else statement. This function is invoked when the desired properties are updated. The default platform of your IoT Edge is set to amd64 in your VS Code status bar, which means your NodeModule is set to Linux amd64 version of the image. Change the default platform in status bar from amd64 to arm32v7 if that is your IoT Edge device's architecture. Verify that the template has the correct module name, not the default SampleModule name that you changed when you created the IoT Edge solution. The registryCredentials section stores your Docker registry credentials, so that the IoT Edge agent can pull your module image. The actual username and password pairs are stored in the .env file, which is ignored by git. Add your credentials to the .env file if you haven't already. If you want to learn more about deployment manifests, see Learn how to deploy modules and establish routes in IoT Edge. 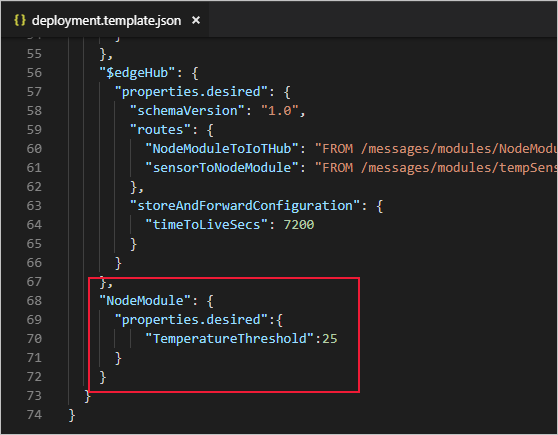 In the previous section you created an IoT Edge solution and added code to the NodeModule that will filter out messages where the reported machine temperature is below the acceptable threshold. Now you need to build the solution as a container image and push it to your container registry. Use the username, password, and login server that you copied from your Azure Container Registry in the first section. Or retrieve them again from the Access keys section of your registry in the Azure portal. When you tell Visual Studio Code to build your solution, it first takes the information in the deployment template and generates a deployment.json file in a new config folder. Then it runs two commands in the integrated terminal: docker build and docker push. These two commands build your code, containerize your Node.js code, and then push it to the container registry that you specified when you initialized the solution. You can see the full container image address with tag in the docker build command that runs in the VS Code integrated terminal. The image address is built from information in the module.json file, with the format <repository>:<version>-<platform>. For this tutorial, it should look like registryname.azurecr.io/nodemodule:0.0.1-amd64. Did you sign in to Docker in Visual Studio Code using the credentials from your container registry? These credentials are different than the ones you use to sign in to the Azure portal. Is your container repository correct? Open modules > nodemodule > module.json and find the repository field. The image repository should look like <registryname>.azurecr.io/nodemodule. Are you building the same type of containers that your development machine is running? Visual Studio Code defaults to Linux amd64 containers. If your development machine is running Linux arm32v7 containers, update the platform on the blue status bar at the bottom of your VS Code window to match your container platform. In the quickstart article that you used to set up your IoT Edge device, you deployed a module by using the Azure portal. You can also deploy modules using the Azure IoT Hub Toolkit extension (formerly Azure IoT Toolkit extension) for Visual Studio Code. You already have a deployment manifest prepared for your scenario, the deployment.json file. All you need to do now is select a device to receive the deployment. In the VS Code command palette, run Azure IoT Hub: Select IoT Hub. Choose the subscription and IoT hub that contain the IoT Edge device that you want to configure. Right-click the name of your IoT Edge device, then select Create Deployment for Single Device. Select the deployment.json file in the config folder and then click Select Edge Deployment Manifest. Do not use the deployment.template.json file. Click the refresh button. You should see the new NodeModule running along with the TempSensor module and the $edgeAgent and $edgeHub. Once you apply the deployment manifest to your IoT Edge device, the IoT Edge runtime on the device collects the new deployment information and starts executing on it. Any modules running on the device that aren't included in the deployment manifest are stopped. Any modules missing from the device are started. 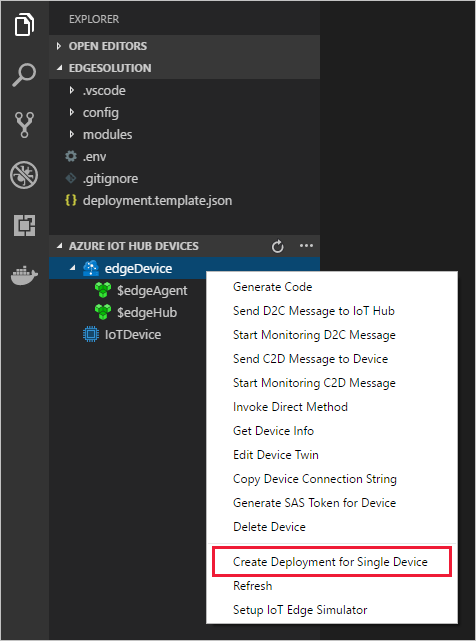 You can view the status of your IoT Edge device using the Azure IoT Hub Devices section of the Visual Studio Code explorer. Expand the details of your device to see a list of deployed and running modules. On the IoT Edge device itself you can see the status of your deployment modules using the command iotedge list. You should see four modules: the two IoT Edge runtime modules, tempSensor, and the custom module that you created in this tutorial. It may take a few minutes for all the modules to start, so rerun the command if you don't see them all initially. To view the messages being generated by any module, use the command iotedge logs <module name>. You can view the messages as they arrive at your IoT hub using Visual Studio Code. To monitor data arriving at the IoT hub, click ..., and select Start Monitoring D2C Messages. To monitor the D2C message for a specific device, right-click the device in the list, and select Start Monitoring D2C Messages. To stop monitoring data, run the command Azure IoT Hub: Stop monitoring D2C message in command palette. To view or update module twin, right-click the module in the list, and select Edit module twin. To update the module twin, save the twin JSON file and right-click the editor area and select Update Module Twin. To view Docker logs, you can install Docker for VS Code and find your running modules locally in Docker explorer. In the context menu, click Show Logs to view in integrated terminal. In this tutorial, you created an IoT Edge module that contains code to filter raw data generated by your IoT Edge device. You can continue on to either of the following tutorials to learn about other ways that Azure IoT Edge can help you turn data into business insights at the edge.